What’s good? 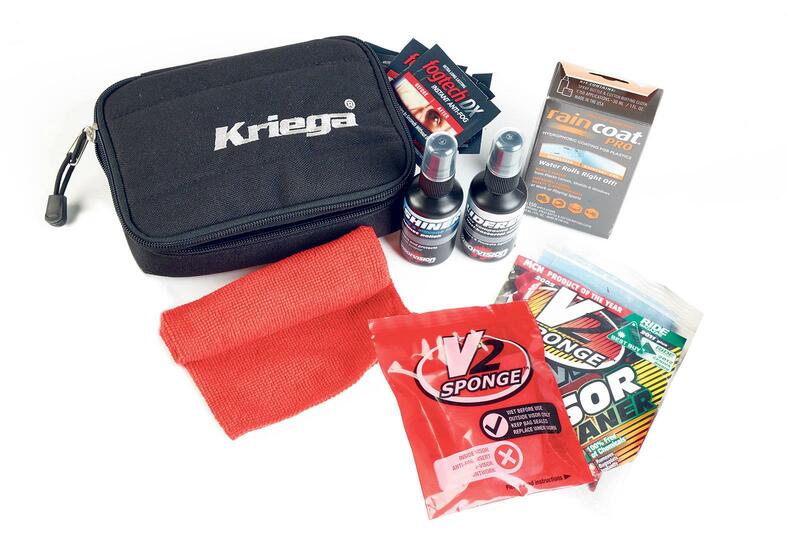 The Visorvision kit has pretty much everything you need for taking care of your helmet. Inside are two V2 sponge visor cleaners, 12 Fogtech DX anti-fog sachets, a Raincoat Pro bottle, a Lidfresh sanitiser spray, a Shiner helmet polish, a microfibre cloth, two sets of earplugs and the whole lot is packaged up in a handy Kriega Kube travel bag. Everything in the kit does exactly what it says on the tin, with the Raincoat Pro (a spray that makes water bead up and run straight off your visor) the stand out star. There’s a lot of travel involved in working for MCN and I don’t go anywhere without it. What’s not? The Fogtech sachets are good initially, managing to keep the visor in my off-road lid fog free but once the visor has fogged up once the Fogtech’s power seems to fade and it requires relatively frequent reapplication.